One of these days, I'm going to catch up on Damages, I swear. It's been critically acclaimed. It stars Glenn Freakin' Close. By all accounts, it is a consistently amazing show. Hell, I've had the show's first two seasons sitting in my Netflix queue for months. And yet, I've never seen an episode. And I'm not alone here, since the show nearly died after its second season, until DirecTV swooped in for a rescue, just as they had before with the also-awesome Friday Night Lights. Now the show's third season is coming to DVD, and I'm really running out of excuses. A show that's spoken about as glowingly as Damages is deserves to be seen. There are too many good shows that have died with a single season or less under their belt, so it's time to give this one its due. I mean, I wouldn't even have to sacrifice that much to make it happen. There have been plenty of times I could have watched Damages. I could have gotten up off the couch, picked up the remote, and just watched it right then and there. Instead, I watched like three episodes of Silent Library on MTV, and that's just unforgivable. That's it. I'm making a pact. 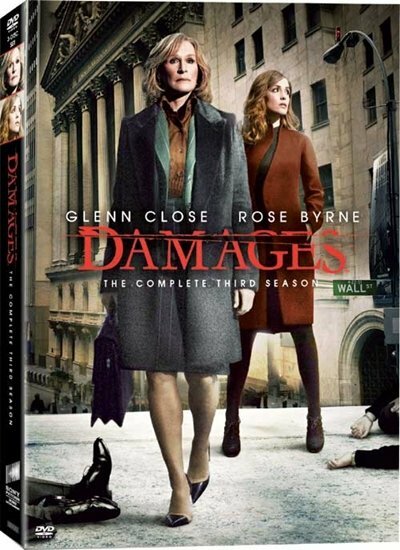 This year is the year I finally watch Damages. You know, unless something else comes up. Inspired by recent worldwide economic events, the acclaimed third season of the award-winning legal thriller stars two-time Emmy-winner Glenn Close as litigator Patty Hewes. Confronting the most challenging case of her illustrious career, Patty and trusted lieutenant Tom Shayes (Tate Donovan) meet their match against the manipulative Tobin family empire, matriarch Marilyn (Lily Tomlin), son Joe (Campbell Scott) and the clan's loyal attorney Leonard Winstone (Martin Short). When former protégée Ellen Parsons (Rose Byrne) is also pulled into the maelstrom, she discovers she hasn't escaped Patty Hewes after all.